Single-deckers were always very much in the minority in Manchester Corporation’s fleet. In 1958 a batch of six Albion Aberdonian MR 11L entered service. These had Seddon B42F bodywork. Manchester City Council’s Transport committee had decreed that the bus fleet should be composed of Leylands and Daimlers, so the order for Albions fell outside this policy. Since Albion was a part of the Leyland group, the batch were registered as "Leyland Aberdonians" and the word Leyland appeared on their tax discs. When new they carried "Albion" badges on the front, but these were soon removed. Due to their unsatisfactory durability, they were withdrawn in the late sixties, after only ten years of service. The photograph shows 44 (UXJ 244) passing under a footbridge on Princess Parkway, around 1968, not long before withdrawal. 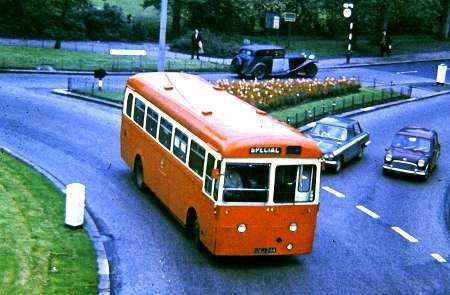 These were the only postwar Manchester buses to carry the -XJ registration mark. They were unusual in having an offside cab door; the driver could not enter/leave the cab through the passenger door as was usual on underfloor engined buses. Don, All Manchester’s underfloor single deckers and the Airport half deckers, until Albert Neal eventually got his Tiger Cubs, had offside cab doors. As for the Albion’s durability the body was poor and the chassis not good but their demise in the fleet was due to the fact that Neal didn’t want them and they were used as little as possible when the Tiger Cubs arrived in 1961. They were sold by Ralph Bennett as soon as they were written down in the Department’s accounts. They were also unique as the only post war buses sold by Manchester for further PSV use, albeit across the Irish Sea, one staying in the area for use by a band. Given their reputation they all survived for some time – though, of course , they had hardly any wear and tear. Just to correct my previous comment regarding the offside doors on the Airport half deckers, only the batch on Royal Tiger chassis had offside driver doors. The Tiger Cub batch did not. Regarding the removal of the Albion badges, "soon" is a bit misleading. Some survived until repainting circa 1962. Michael, there were two post war MCTD motor buses registered in the VU series, both due to administrative error, plus fifty four trolleybuses being the Crossley Empire and Dominion series. In July 1948 2108, the last of a batch of Crossley DD42s was registered in the GVR series as GVR 111, some five years after the series had been allocated to the Department and some two years after the decision on registrations for over 300 vehicles the Department received as the first post war deliveries arrived. A private motorist had applied for GVR 111 for his Vauxhall and the department agreed to release the number and 2108 became HVM 621, the next number available in Manchester in 1948. In 1949 the last batch of DD42s arrived (2160-2219) and these were to have been KNA 601 to KNA 660. Prior to registration, someone in the Department determined that GVR 111 had not been allocated to a bus and the registration belonged to the Department. In July 1949 2160 was delivered and took to the streets as GVR 111, the rest of the batch becoming KNA 601 to KNA 659. In the pre computer, ANPR and local registration authority days the duplication with the car passed unnoticed. The car had moved to another area so when it was re-taxed the duplication was not noticed and it was 1954 before the error came to light and NVU 137 was hastily applied to 2160. Ten years later in 1964 the last batch of PD2s to be delivered was registered 3696-3720 VM (3696-3720. An error in the Motor Tax Department reissued 3696 VM to another vehicle. When the error was discovered, as Manchester had 889 VU available in its Ambulance Department, this was issued to 3696. So the only two post war VU registered motor buses MCTD ran were each the first of the last batch of two significant types which played a major role in the Department’s history. Phil, I’d forgotten about the Crossley trolleys, by the time I became a "spotter" there were only the BUTs (and those only just) so the Crossleys were a bit off my radar though I think there’s one at Boyle St. Thanks for clarifying the 3696 story – the first of the batch which along with the previous 3671-95 surely had the deepest induction roar of any PD2s. Michael, I think Stockport’s Crossley bodied PD2s were even louder and deeper. Considering that Manchester had so few single deckers what work did they actually do? There were a number of routes, mainly feeders from estates within the city boundaries and overspill areas outside the city boundaries, to main roads served by trunk routes, to nearby towns such as Middleton or Oldham or to local shopping centres in Wythenshawe, but two all day trunk routes existed, the #22 between Levenshulme and Eccles – with low bridges at both ends, and the #31 from the City to Bramhall with a low bridge at Cheadle Hulme where single deckers were the only option until the 1960s. Manchester had a private hire licence which allowed it to operate well beyond its boundaries and single deckers were often used. Two single deck City Circle routes ran for a time in the city centre linking the stations and shopping areas. 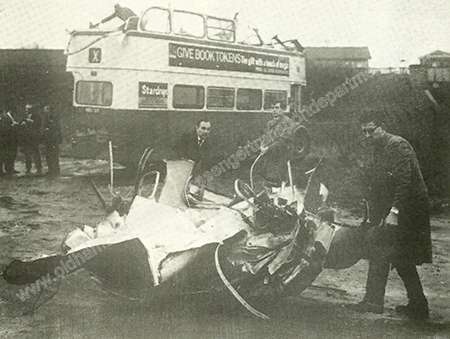 In addition single deckers were used to supplement double deckers at rush hour and Ralph Bennett converted a number of double deck all day routes to single operation. As an addendum to Phil Blinkhorn’s comment it shouldn’t be forgotten that the single deckers in Manchester also tended to be the guinea pigs for any omo fare collection systems dreamt up in the bowels of Piccadilly or Devonshire Street. The original stabs at this took place as early as the 1920’s in normal control vehicles and but weren’t embedded for any length on a route until 1949 when the 110 feeder service was introduced and this which remained single decked (albeit with forward control from 1953) until incorporated in a longer double decked route in the late’60’s. In between those times the six single deckers that are the subject of this article were, in addition to their feeder service duties, employed on the rush hour Express Service 130 following the withdrawal of Crossley DD42’s on the route, much to the chagrin of the passengers of which I was one. Noisy, rattley and decidedly utilitarian they were very unpopular and the introduction of omo with slow loading and exit times on a traditionally fast route did little to endear them further. In an experiment to speed up loading the department introduced ‘carnets’ of tickets, 10 for the price of 9. The tickets had a small magnetic oblong on their reverse which when fed into a slot reader mounted on the entrance bulkhead head was supposed to issue a beep. Within a fortnight most of the readers had failed and until the ‘carnet’ facility was withdrawn the torn off tickets were just handed to the driver. Fortunately the Albions were fairly soon replaced on the route by new Panther Cubs which had, at least, wider entrances than the Albions but the electronic ticket cancellers were no more reliable than the gated access on the Panthers than followed them. However, the latter did restore Journey times. Another route using single deckers was the 56 Halfway House, Cheetham Hill to Hollinwood Station. These replaced double deckers when they became One Man Operated. It meant the service could go under the low bridge and stop opposite the railway Station. Double deckers were still used for extras and on a few occasions the drivers forgot about their height and got stuck under the bridge, much to other drivers mirth. Another single decker service I remember, was on the 7 Manley Park Brookdale Park. It operated a 6d minimax fare system. The passengers had to put a sixpence coin in to go through a turnstile for any length journey. The half fares had to use the right hand turnstile. It was not a great success. Don Harris (Garage Foreman), Eric Watts (Assistant Chief Engineer), and Bill Connelly (Assistant Depot Foreman). History does not say who the Driver was or his ultimate fate. Phil, do you know what became of all six of the Aberdonians? I understand the whole batch was bought by the dealer Dodds of Dromara in Co. Down but where did they pass on to. I believe UXJ 244 may have been with the Fermanagh County Education Committee?